I was long-distance for this entire project, so the only credit I can take is encouraging the purchase of an entertainment unit for the purpose of converting it into a kitchen, and making sure my sister, Shanda, had seen adequate inspiration from blogland before attempting this make-over. 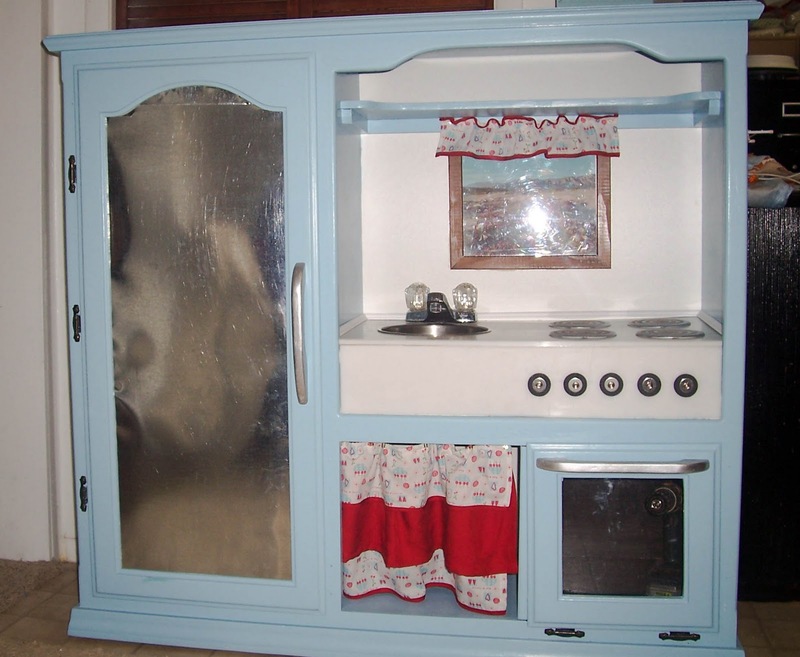 She got things rolling, but it is really my parents who did the bulk of the work on this project, so the first time ever, I am excited to have my dad–one of the miracle workers, himself–guest blog about the amazing work he did on this play kitchen for my niece, Talia. Take it away, Dad! 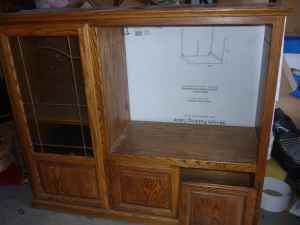 The first task was to find an appropriate entertainment center and then make it into something new and wonderful. Shanda and I found a good quality solid wood unit at Deseret Industries in Provo. It was 47” high by 49” wide and 16+” deep. The top was slightly larger on the front and sides. To the right when facing the unit was a large open area about 28.5” wide by 27” high that had housed a television set. Beneath the TV space was a two door cupboard area 28.5” wide by about 14” high. To the left was a 19” wide by 42” high space with three adjustable shelves. The glass in the door to this area was missing, which was a benefit to the project. A major challenge was to build this on the cheap—no big investments in materials etc. We met this challenge by collecting left over paint from our daughter, Marenda and her husband’s projects, and using pieces of scrap wood, etc. from projects in my shop. 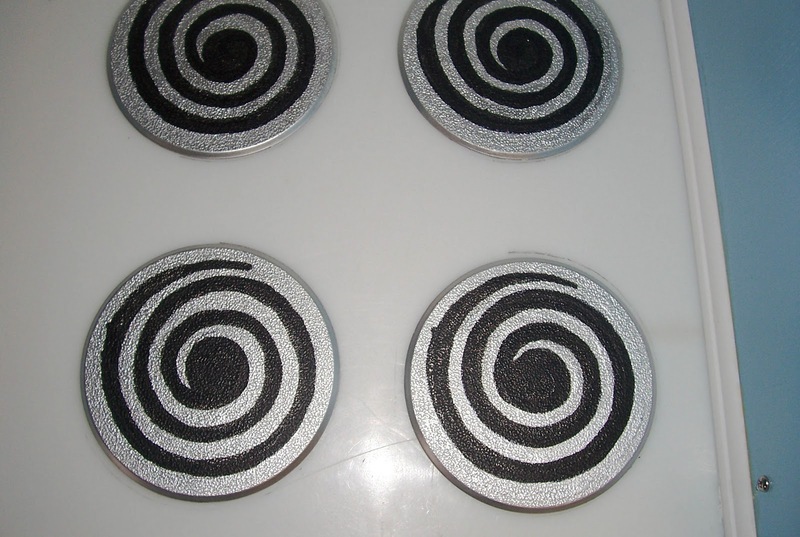 We did buy three of cans of spray paint (one silver and two white) and a sample size can of black paint and two magnetic closers for cabinet doors and 16 small brackets. 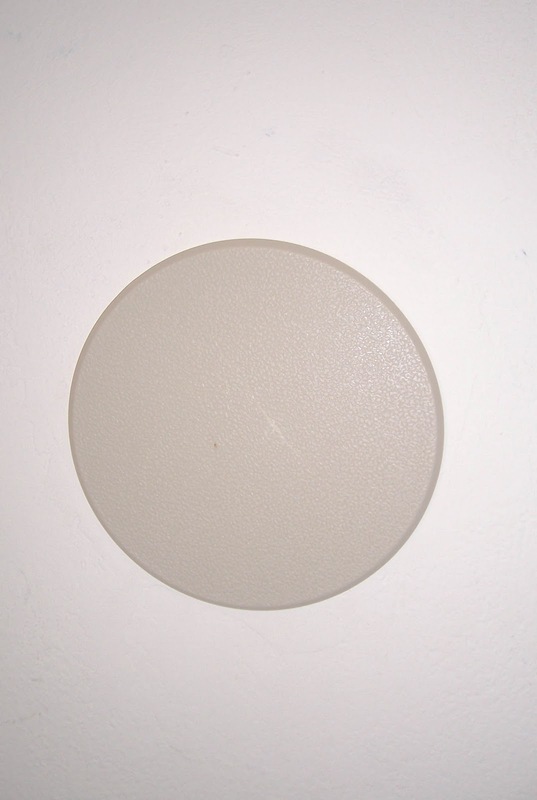 We also purchased a piece of sheet metal and four 5” round “wall repair” plates to stop doorknobs. These last are self-adhesive and were painted silver with black coils on them to serve as burners for the cook top. Not counting time, we spent about $50.00 on materials. 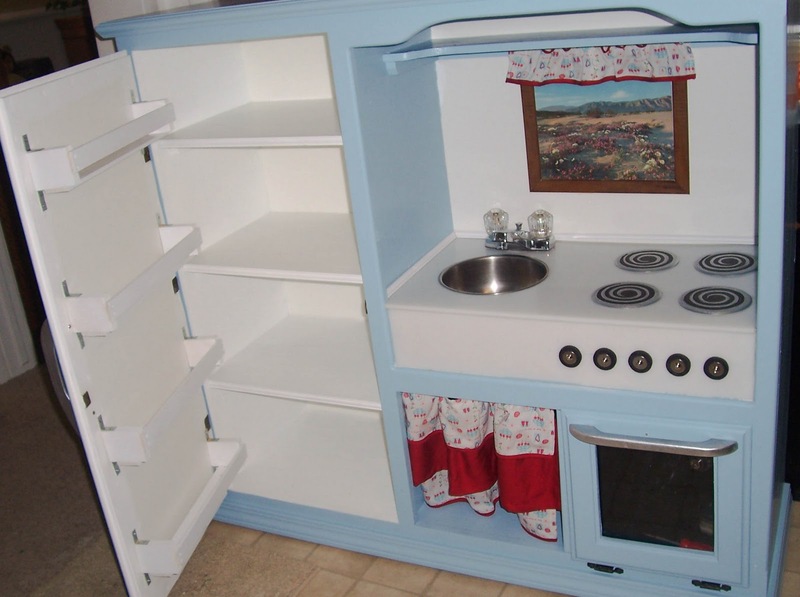 With the original purchase, we have a very nice kitchen for $75.00 to $85.00. We think it compares well to commercial units that sell for five or six times our cost. By working part-time on this project we took about three months to build it. However, if you can dedicate full time to this, I estimate it should only take a week or less. 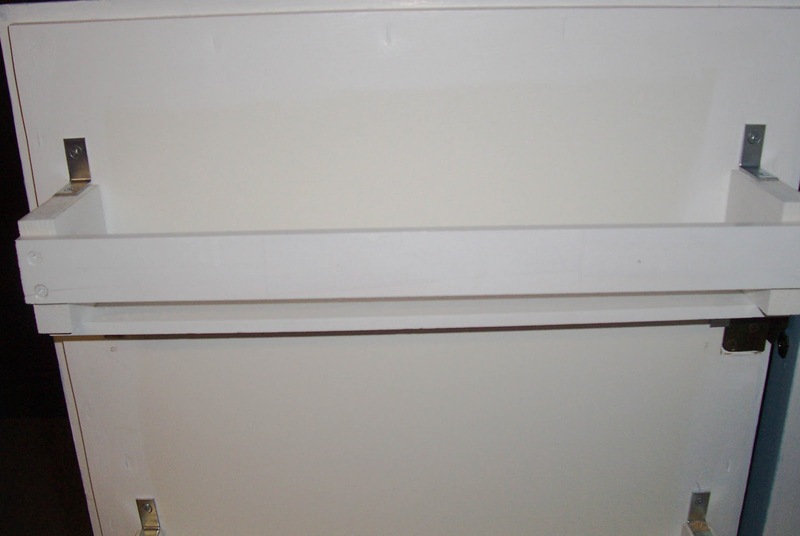 After removing the three doors, I secured a piece of wood in the lower cupboard area that divided the space in half. 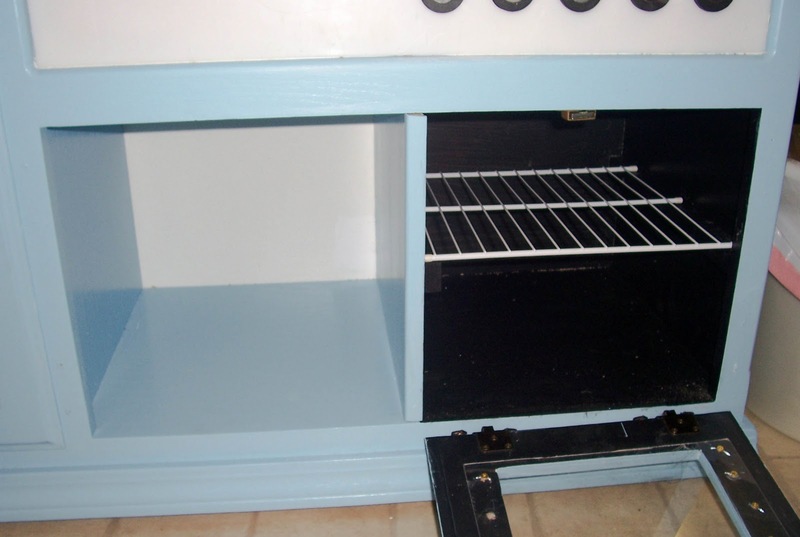 The right side would become the oven and the left side would become an under the sink storage space. 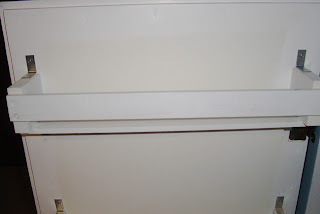 About 5” or 6” from the top of the sink and stove top area I installed a shelf that was 9” wide by 28.5” long. After it was mounted, Janice decided it was too deep for toy dishes and things, so I cut it down to 6” wide with curved, 2” ends extending to the original 9” width. I sanded the whole unit to remove or at least rough up the original finish so it could be painted. Janice (Miracle Worker Mom) was our artist. She painted all of the paintable surfaces of the unit. 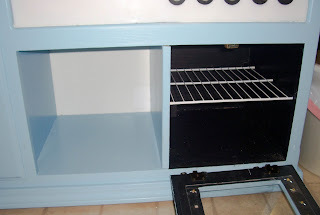 There are three coats of a pleasant blue on the outside surfaces, white paint on the interior of the fridge and black inside the oven. 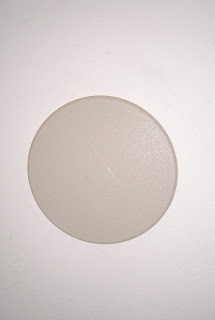 After cutting the plastic piece to fit the space for the counter top, I measured and cut out a hole for the sink. We installed a new faucet in our bathroom and cleaned up the old one to use in the toy kitchen. 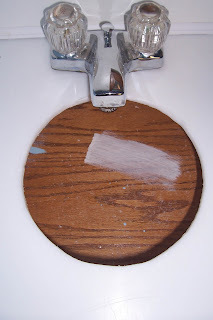 I drilled holes for the faucet and mounted it with the same nuts that had held it in place for the bathroom sink. I cut the lever that opened and closed the drain and bent it so it will move an inch or so but not come out. 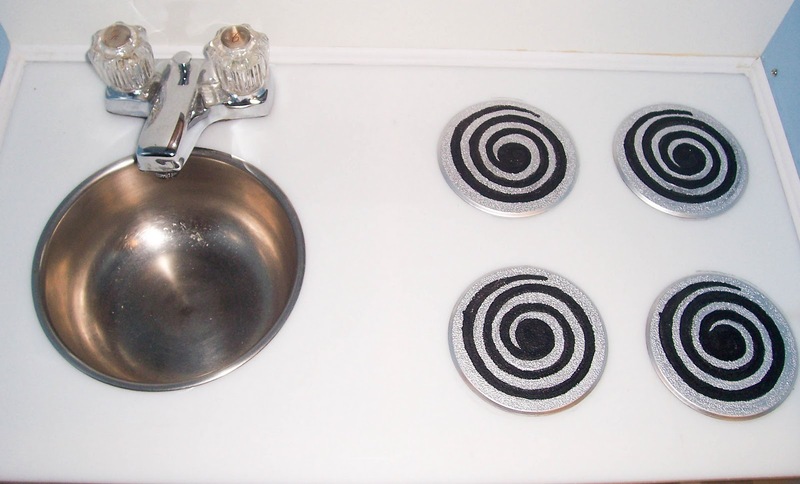 With a stainless steel bowl that we were not using, the sink looks very nice. As mentioned above, the four round “wall repair” plates were painted to be the burners for the stove or cook top. We used their self-adhesive glue to mount them in place. The control knobs on the front were cut out of quarter inch wood with a key-hole blade on a drill, sanded, painted black and silver and then screwed through the plastic and into the wood frame. The oven was an interesting challenge. The doors were solid wood. To have an oven door with a window in it I cut out the inside panel with my oscillating cutting tool. This gave is a clean cut that sanded up nicely. After painting the inside surface black (and the outside blue) we attached a sheet of Plexiglas cut to cover the opening to serve as the window. 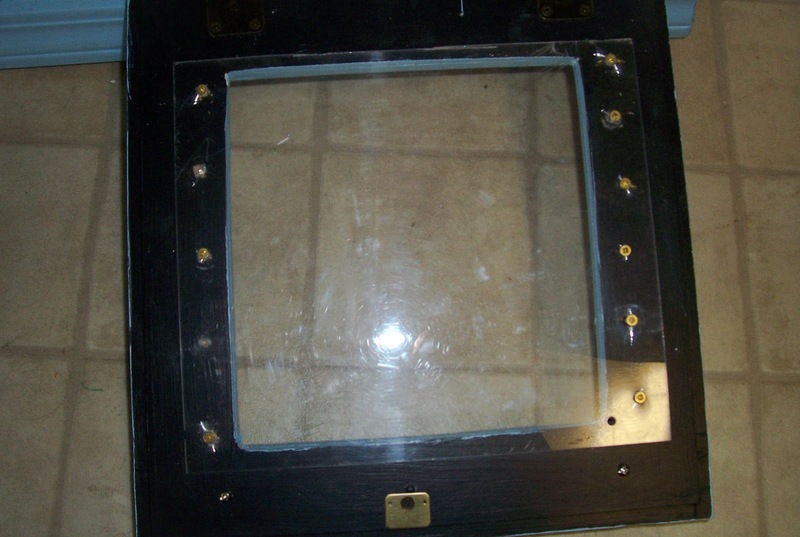 We used the original hinges, but mounted the oven door on the bottom of the opening instead of the side as it was on the original entertainment unit. We tried to find a chrome towel rod and chrome handles for the oven and refrigerator doors, but were unsuccessful, so I cut handles for the doors and the towel rod out of pine wood. After cutting and sanding, Janice painted them silver. 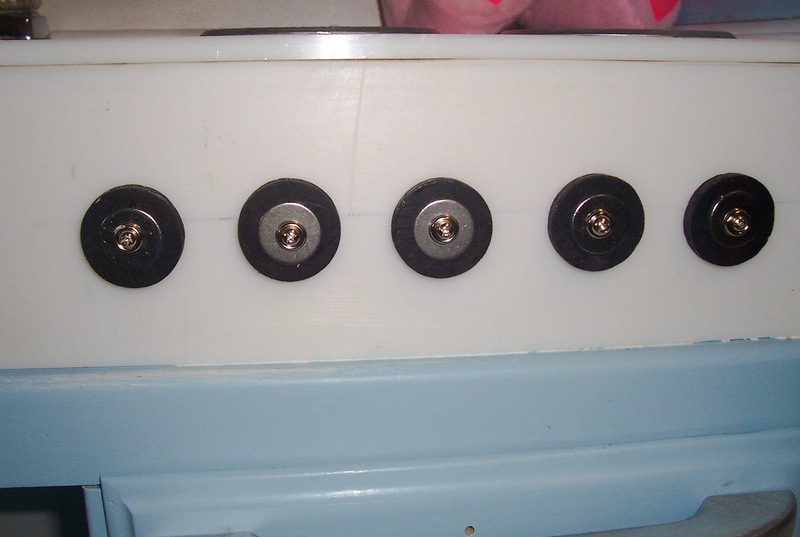 After the doors were mounted we attached the handles by screwing them to the doors and mounted the towel rod on the side of the unit. We measured the space for the refrigerator to divide it evenly. I installed the three sets of wood supports for the shelves to sit on. This provided four spaces of approximately 10” high by 15’ deep by 19’ wide. Since I seem to remember a natural urge to climb, I anchored the shelves to protect the little ones. For the refrigerator door, I cut a piece of Masonite to fit the area where the glass had been. I bought a 36”x 24” piece of sheet metal normally used for duct work. 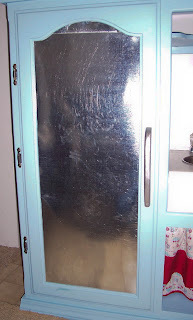 This shinny metal was wrapped around the Masonite and the combined unit was fitted into the door. I secured this unit by covering the back of the door with a piece of thin Masonite that was finished a smooth white on one side and stapling it to the wooden door. This holds the sheet metal tightly in place and provides a finished white for the inside of the refrigerator and gives the outside of the door a “stainless steel” look that also holds magnets, just like a real fridge. Since this new door with sheet metal and inside racks weighs more that it did originally, I mounted it with three hinges instead of the original two. After all of the fitting of shelves, doors, etc. were in place, I covered the back of the unit with thin sheets of Masonite. The white finished side provides a nice interior back for the fridge as well as a white wall for the sink and cook area. The oven interior was painted black. We had planned to “speckle” it by flipping white paint droplets from a paint brush, but our technique was lacking, so the oven is just black. I cut a rack to fit from left over closet shelving and mounted it on supports in the middle of the oven. Shanda wanted a kitchen window over the sink, so we framed in a Plexiglas holder with inch wide molding and glued it to the middle of the “wall.” This holder allows for inserting appropriate 8.5” x 11” pictures of what might be seen through the window. At least seasonal changes are recommended. Janice sewed up a small curtain that was mounted at the top of the window. 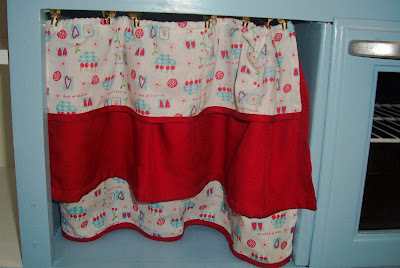 She also made a curtain to cover the storage space under the sink that I mounted with a small dowel rod. All the clocks we tried were too large for the kitchen so we cut a 6” diameter round piece of pine and sanded it and painted it and attached the face and hands of an old clock that had stopped working. My final step was to reinforce the back panel. I glued and stapled strips of 1” and 1.5” wide by the height of the unit. 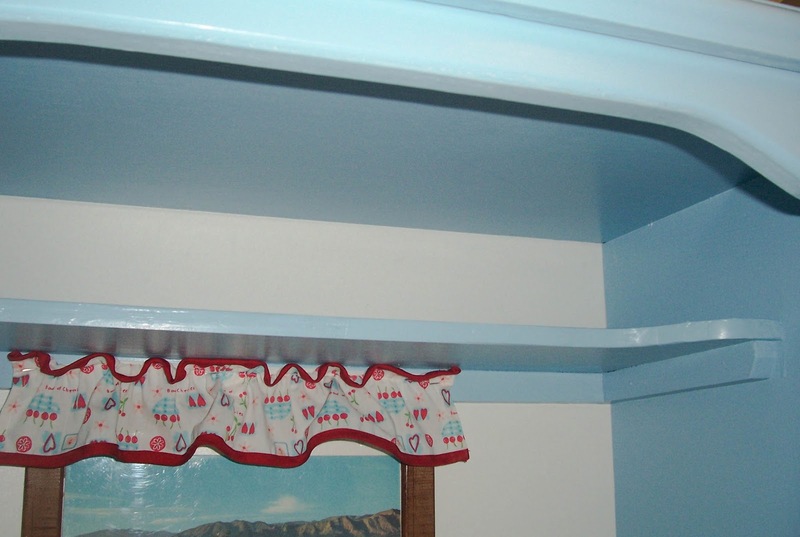 This supports the window frame and anchors the back at all of the shelves and structural parts of the unit. Thanks, Dad! You guys blew me away! Couldn’t you just die from the cuteness? I showed the picture to my 3 year old, and she was pretty jealous, even though she already has a play kitchen–but I refuse to give it a makeover until she grows out of drawing all over it in marker! I’m not going to lie and tell you a project like this is a piece of cake, but I think you can see the grown-ups had a lot of fun with it, and it is destined to be an heirloom piece of furniture that can be handed down for generations. The other great thing about this project is that with the changes in technology, old entertainment units are readily available now at thrift stores and craigslist. And let’s be honest, they are much cuter as a play kitchen than they are housing bulky TV’s and VCRs. Have you attempted any projects like this? I’d love to see them! This is one of the most clever ideas I have seen lately! So stinkin cute!! How sweet! Not only did this turn out so amazing, but for Talia to have a kitchen that so many family members helped to make…now that is priceless! My favorite gifts for my children are the ones that are made by loved ones! Thanks for sharing. WOW! You are super creative! Wow! I want a grandpa. This is for serious the best thing I've seen all month!! I could spend all day looking at curios-turned-playsets, I'm dying to make one of my own! Great job, this looks fantastic!! This is darling! I bet it was a lot of hard work but I love all the little details you put into it. Great job! 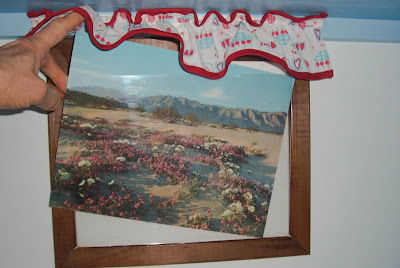 I am having an "every crafty blog" linky party and would love for you to come and join! i made one too, out of ikea furniture. i love these hacks! Absolutely adorable! My daughter (and son for that matter) would LOVE it. came from TT&J – I hope to enlist my dad in this project too when it gets warm 😉 Bookmarking for inspiration! I love this as an adult. I can't begin to imagine how happy I would have been as a child to have this kitchen set. What wonderful parents and grandparents to make this happen! My favorite part is the little picture window! I'm not gonna lie- this makes me want to come to your house to play…. as an adult! This is awesome, thrifty, and SO well done! I think this definitely beats the generic that most kids have. Great job! Wow wow WOW!!! I would love for you to link up!! this is absolutely adorable. and what a great idea!! 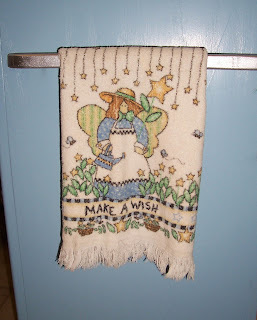 i'm always looking to recycle old things and make them into something new! Good Work! Well done, it turned out so cute. 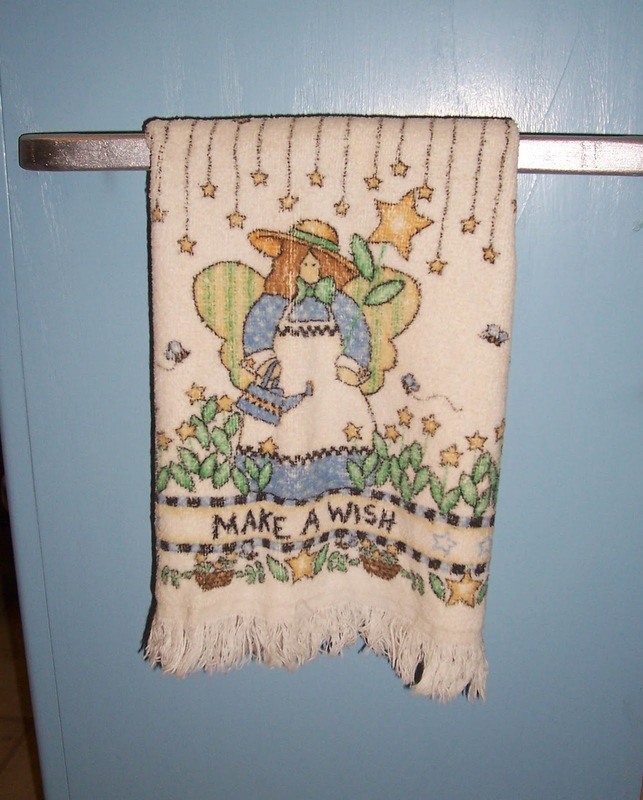 You will get lots of use from this for years to come, and it will make for a lovely heirloom. 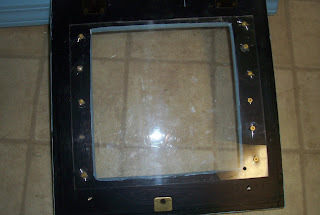 For the plexiglass on the inside oven door, we framed around it so that little figers wouldn't catch the sharp edges. I thought the cardboard play kitchen we made was cool, but this is SO much cooooler! I made mine out of a night stand since I wasn't sure I'd want such a big project and product. This kitchen is probably the best one I've seen, and I did my research! It's very perfect. 🙂 All the best features are there. Anyway, just browsing the LPM forum and stopped by. This is genius. It's so simple, but brilliant. Fantastic. This is fantastic! This summer I madea play kitchen for my kids from an old dry sink. Used a real faucet, an steam tray for the sink and old stove grates for the stove, then built a hutch portion to go on the back. They love it! So glad to see others are doing things like this too. I am in love with this! We splurged at Christmas and bought a Step 2 which was outrageously priced. I’m so jealous of your beautiful DIY kitchen set. Thanks for sharing! That looks as much fun to build as it is too play with! Is it bad that I realllyyyyy want to play… It looks so much better than anything bought made of tacky plastic. Wow, that came out super-awesome! I like it even better than the ones the stores sell for so much money!